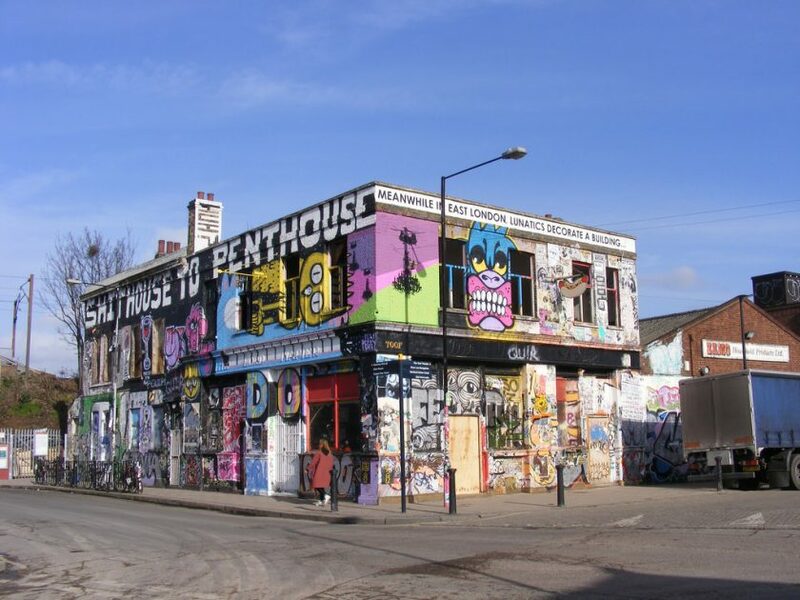 From Banksy to Lord Napier – the Kip Hotel street art guide to East London. 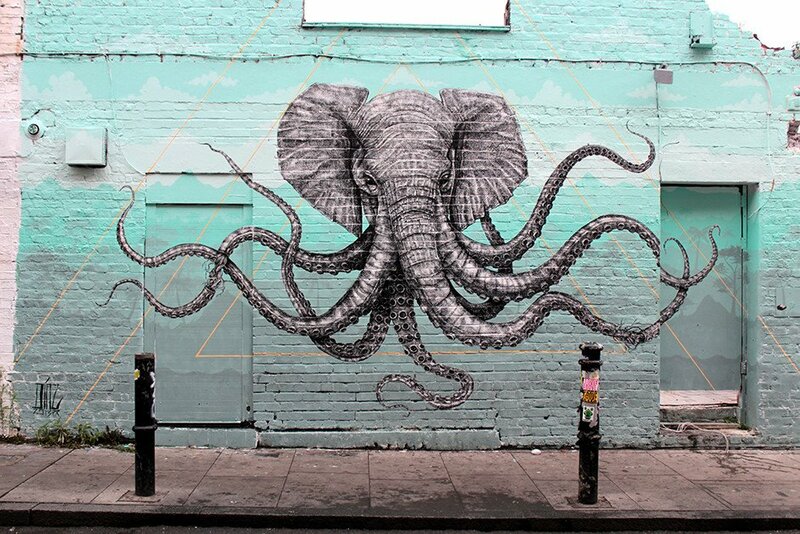 East London is home to one of the world’s largest commissioned and uncommissioned collections of street art. Take a walk around Shoreditch or a stroll through Hackney Wick and you’ll discover some hidden, and some not so hidden graffiti masterpieces. Being in Hackney, Kip has some of the most impressive works of street art London has to offer on its doorstep, so when you stay with us make sure you take the opportunity to go out, explore and be inspired by the some of the greatest pieces of street art in the world! French street artist Thierry Noir is one the forerunners of modern street art and is credited with being the first artist to paint the Berlin Wall. During his time in Berlin, he spent nearly six years painting his cartoon-like depictions of animals and humans on the wall at a time a when such artistic expression was strictly forbidden. 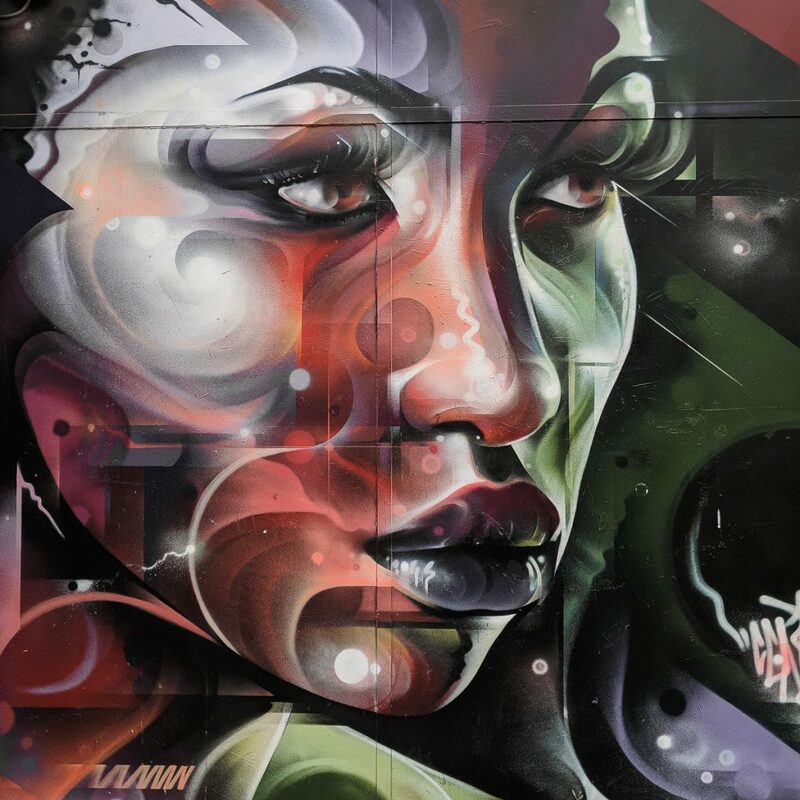 If you head to Wallis Road in Hackney Wick, you’ll find a fantastic example of his work on the side of a warehouse – pictured above. This mural was done ahead of an exhibition of his called “Jazz” which was on display last year at the Howard Griffin Gallery in Shoreditch. 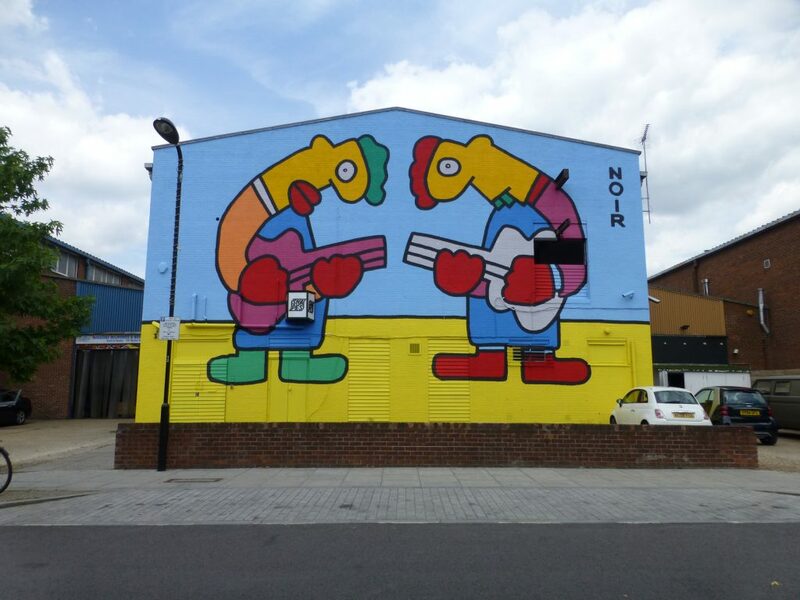 The bright block colours, as well as the cartoon nature of the figures, make this work instantly recognisable as the work of Thierry Noir. 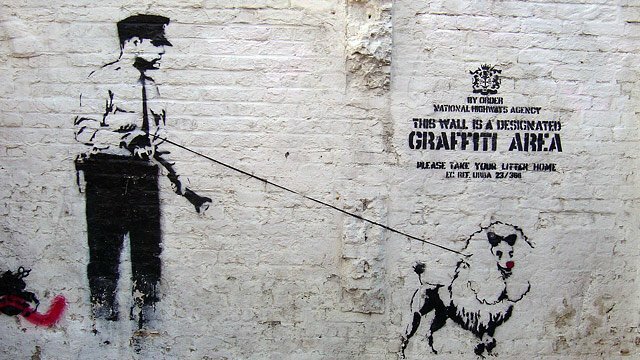 One of the most controversial street artists in the world, the anonymous Banksy is also one of the most well-known. His distinctive stencilling technique is instantly recognisable worldwide and even 20 years after his first mural appeared, his identity has never been revealed. Over the years, Banksy has made a number of Murals across London with east London being the focus for the majority of them. The one above has been called “Designated Graffiti Area” and can be found around the back of Cargo Club in Shoreditch. Above is a mural by campaigning street artists Louis Masai and Jim Vision. 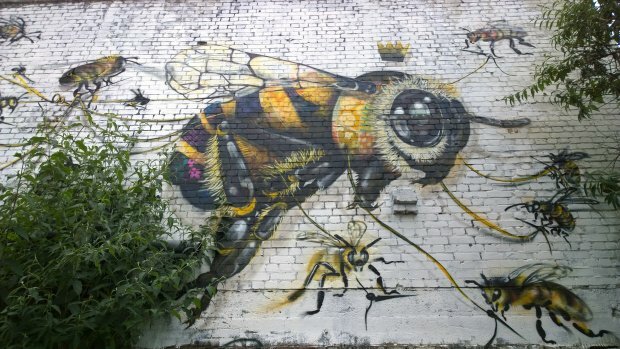 This mural on Hackney Road is part of a wider project called Save the Bees, which centres around raising awareness for our declining bee population. Both Louis and Jim are both internationally recognised graffiti artists and have some pretty interesting projects going on. Louis predominantly does big projects focusing on endangered species, both here and in America and Jim works with London based mural agency EndoftheLine working on projects for large international brands. “I started making art on the streets because, as a homeless person, they were the safest place to keep my work” says artist Stik, whose images can be seen from Hackney to Jordan, and are even found inside the homes of rock stars Elton John and Brian May. From being homeless and making the transition to struggling artist, Stik is now an internationally renowned street artist, whose work can be seen all around Hackney and across London. He paints stick-like figures that depict the everyday struggles faced by contemporary UK society and although very simple, these figures are extremely expressive. This awesome piece of art is by Puerto Rican artist Alexis Diaz aka La Pandilla. A testament towards his signature style of combining animals and humans, this elephant-octopus hybrid mural is made up of thousands of tiny brush strokes.